Having done extensive ground work since arriving onto the Irish music scene in 2014 with their self-released debut EP, 2016 has gotten off to a fine start for Donegal’s own folk-pop duo Little Hours. The release of their major-label debut single (which has passed the one million streams mark on Spotify), and an appearance on The Late Late Show has seen the band edge further into public consciousness, and with them popping up on radio playlists up and down the land, there’s a feeling of a major breakthrough just around the corner. Previous support slots with such established heavy hitters as James Bay, Kodaline, and Walking On Cars have seen them hone their live show whilst accumulating a dedicated, ever-growing fan base along the way. This month sees the band heading out on only their second ever headline tour of Ireland, and Dublin’s Smock Alley Theatre proves an excellent choice of venue for a date in the capital. With no raised-stage, and a seating arrangement which ensures an excellent vantage point for everyone in attendance, tonight’s intimate show feels more like a softly-lit open rehearsal than just another gig. Tour support Stephanie Rainey opens the show with a strong set showcasing an acoustic pop sound not too dissimilar in style to the main act. Songs such as ’13’ and ‘Beauty In Your Madness’ are littered with pop hooks strong enough to hold the crowds attention before the headliners arrive. Opener ‘Tracks’ is the type of piano-driven rock ballad from which The Fray made their name and one of the more uptempo and urgent moments in the Little Hours catalogue. It’s melodic chorus and Coldplay-style piano chords mark it out as a strong contender for a future single. The atmospheric folk of ‘Tired’ sounds far bigger live than on record, while debut single ‘Water’ has proven an inspired choice to introduce the band to a wider audience, combining all of Little Hours biggest strengths into four minutes: minimalist piano chords, atmospheric drum fills, tight harmonies, a passionate lead vocal and a slick production style that’s as cinematic as the song’s excellent promotional video. With only 5 songs officially released thus far, the focus of tonight’s setlist was always going to be geared towards the newly recorded material due for release later in the year, and the new songs aired tonight show the band aren’t afraid of trying out new styles. ‘The Feeling Never Goes’ is delightfully retro, complete with acapella vocals and handclaps. The shuffling drums of ‘Later On’ hint at a more groove-led approach, while ‘How Could I Love You’ has the same brooding quality as Walking On Cars’ ‘Always Be With You’. Emotion-packed ballads ‘Losing Light’ and ‘Wires’ already sound primed for TV and movie soundtracks and the gently epic ‘Snow’, with its tinkling pianos and military-style, drums has all the hallmarks of a powerful album closing track. Rounding off the evening with their first ever release ‘It’s Still Love’, the band leave to a well-deserved standing ovation. The playing is tight, the lead vocals are consistently strong and the harmonies are flawless all night with two voices that complement each other perfectly. 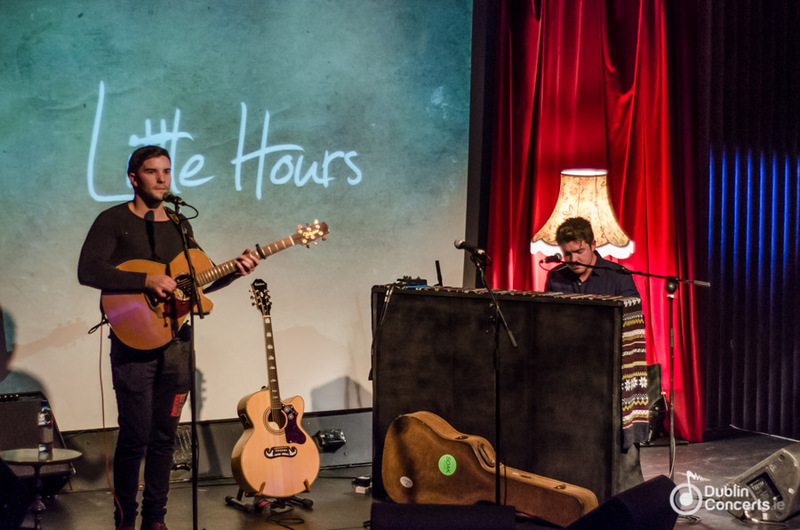 With anticipation building for Little Hours debut album, tonight’s assured performance was the sound of a band really beginning to hit their stride.